Do not remove the board enclosure. Depending on your application, you could be exposing yourself to dangerous voltage levels. Obtain a Performance Pak (AC244002). This unit can be used only with the Performance Pak. Use this unit instead of the high-speed receiver board. 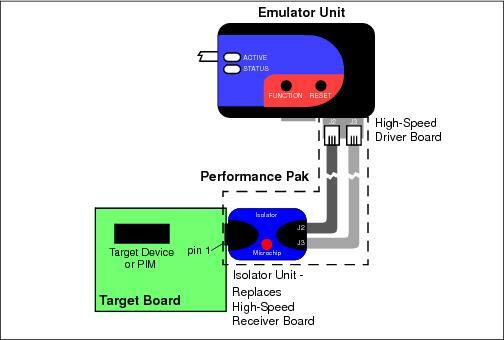 See the “Performance Pak for the MPLAB® REAL ICE™ In-Circuit Emulator User’s Guide” (DS50002528) for pinouts. Connect the isolator to one end of the Performance Pak high-speed cables. Connect the other end of the isolator to the target using an 8-pin, single-line In-Circuit Serial Programming™ (ICSP™) connector. Target voltage must be at 3.3 V.
When using the isolator, trace is not supported.